Whether you’re heading to Pro Hair Live in Manchester or Professional Beauty and HJ Live in London this weekend or not, every savvy salon owner or hairdresser needs to be in the know about with what’s happening in the industry. 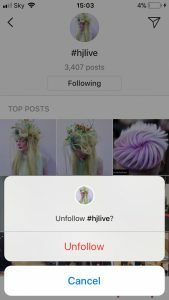 The great news is that it’s easier than ever to stay up-to-date via social media and this year you can expect even more InstaStories and Facebook Lives to really give you a taste of the action. 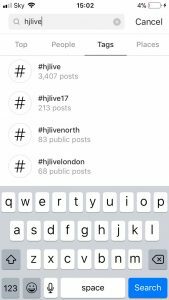 But did you know you can also follow specific hashtags so that images and videos – even InstaStories – tagged with them appear in your feed? This is 2018 instagram (darn you, you pesky algorithm!) so you’re not going to see every single post in your feed, but you will get those that Instagram’s robots think will pique your interest. Don’t want to risk being stuck following the hashtag for life. Fear not. When you’re done just go back into the hashtag and hit the ‘Following’ button, hit Unfollow and it’ll be gone as quickly as it arrived. Of course this doesn’t just apply to the hashtags for hairdressing trade shows. 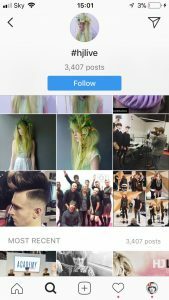 You could – and should – also use it for any hashtags your salon uses, your competitors use, that salons that inspires you use or just about anything that interests to you or your business. I’d love to know if you try this tip and how you get on. If you’ve got any questions about it, or want to chat about how you can get social media working for your salon, drop me a line at kate@kordigital.co.uk. If you want to stay up to date with other social media and website tips and hacks, don’t forget to sign up for my newsletter at the bottom of the page.